Use the app to track stats, live events, and everything you do in Destiny 2 from your smartphone. It might have taken a long, excruciating amount of time, but Bungie's MMO shooter hybrid is upon us. Destiny 2 has finally released, and while it's of course not debuted on Nintendo Switch, smartphones, or anything we'd normally be covering at Modojo, it does have a companion app that's meant for use with both iOS and Android devices. You can also use it on your computer if you so desire. Bungie's Destiny Companion App offers a constant stream of information tailor-made for smartphones and tablets, bursting with tidbits you need to know to get the most out of your game. If you haven't downloaded it yet, make it a priority to do so, since you're a faithful Modojo reader and we know you've got a mobile device to use it on. If you're looking for the Destiny 2 Companion App, your first destination will always be the appropriate iOS page on the App Store for iOS/iPhone users. If you're an Android owner, check out the Google Play Store for the latest version of the app. You can check out user reviews of the app, operating system requirements, and other useful tidbits by checking out these main pages as a starting point. Are mobile apps less your thing when you're home near your computer to just head to a website? Bungie has you covered there, too. Both PC and Mac user can instead use the companion app by heading to Bungie.net and choosing the companion app. Both the mobile and desktop versions will perform in the same manner and offer the same cache of features, but the app will be the most updated and complete experience, according to Bungie. What Does the Destiny 2 Companion App Do? The app is meant to offer several facets of information when it comes to running down everything there is to know about Destiny 2. 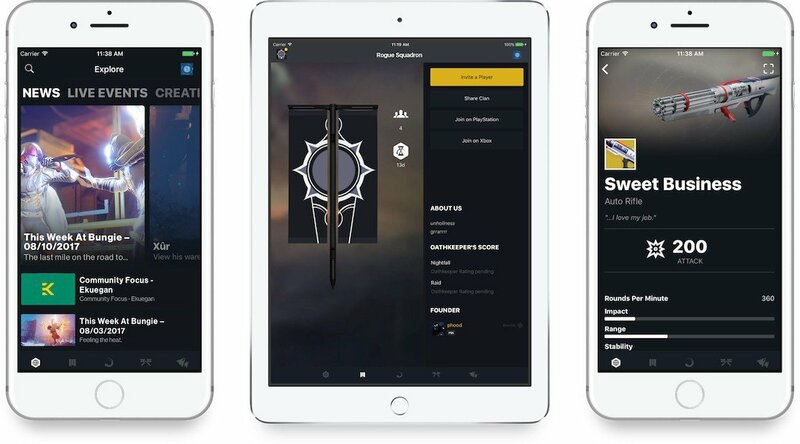 There are five categories, or tabs, the app is split into: Explore, Clans, Progress, Gear, and Find a Fireteam. For instance, the Explore tab will offer information about Destiny 2's updates, events, and other news surrounding the game. The Clans tab is pretty self-explanatory, offering information about your clan and clan activities. If you're not a part of the clan yet, you can search for groups you might want to play with in that tab. Progress will track how far you've gotten in Destiny 2 and what you've accomplished thus far (hopefully a lot, right?) and Gear will let you outfit your characters' equipment like weapons and other items on their person. Finally, use Find a Fireteam to find a quick group for a certain activity you need to complete.